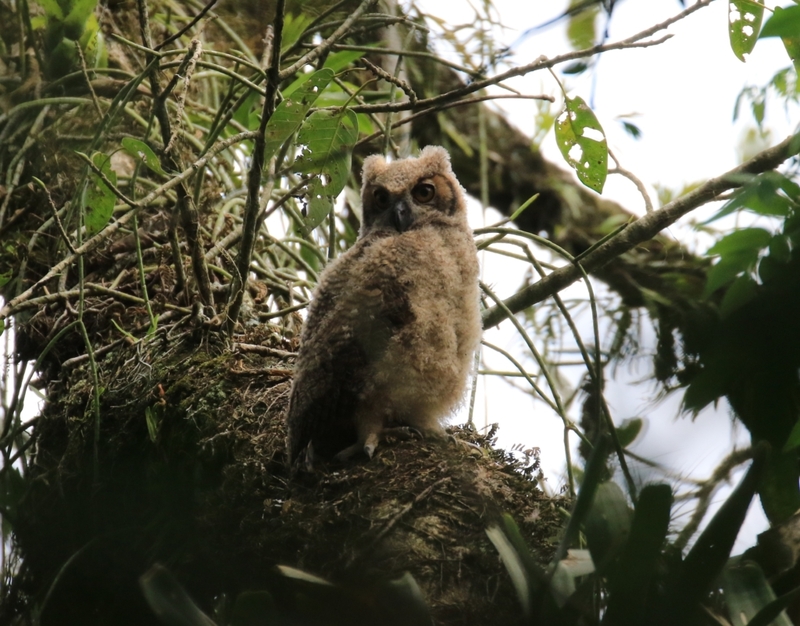 You will all remember that our Great Horned Owls Bubo virginianus were first spotted near to REGUA in August last year by Fito Downs and Adilei, REGUA’s Bird Guide. Many visitors were delighted to see this enigmatic species and Adilei caught some images of their coupling at the time. Adilei and I visited the same tree in late December to take a photograph of the resulting juvenile bird. 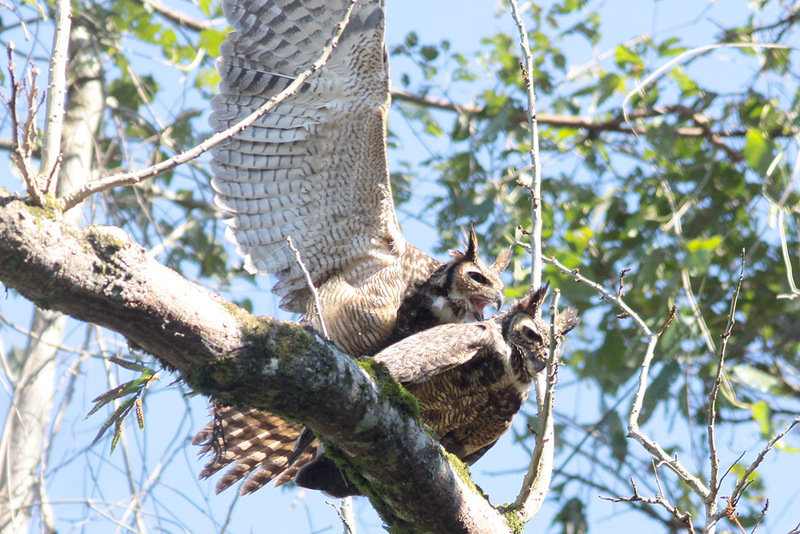 As you can see the juvenile has grown considerably and as it starts its first moult, the downy first feathers are being replaced by the first adult plumage. 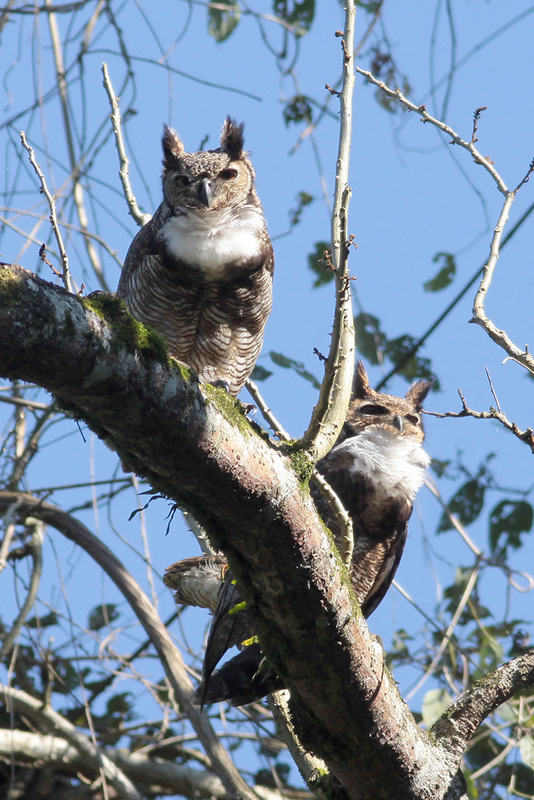 Naturally we are delighted with the progress and hope that the juvenile decides to stay nearby like our Tropical Screech-Owls, we certainly have plenty of old suitable trees in the area. Though the IUCN states that White-bellied Tanager (Tangara brasilensis ) is considered of “least concern” it really is a stunning bird. Flying in small flocks, up to 10 strong, this Atlantic Rainforest endemic can be found at REGUA even close to houses that make up its local villages. It is very responsive to its call, and raises the neck feathers in retaliation to Adilei’s speakers. It seems to like tree canopies at mid-elevation, but with the two tone powder blue plumage, black mouth parts and white underbelly it is unmistakeable. As they appear quite mottled, one is left intrigued if the colourful feather arrangements are identical to all members of this species. Recently renamed the White-bellied tanager; it has been split from its Amazonian cousin, Turquoise Tanager. Those wishing to photograph this bird will not be disappointed. nally one can find it feeding with in a mixed tanager flock. Seeing one in tree canopy is quite usual, but viewing one by the REGUA tower at lowland altitude appears a little out of place. 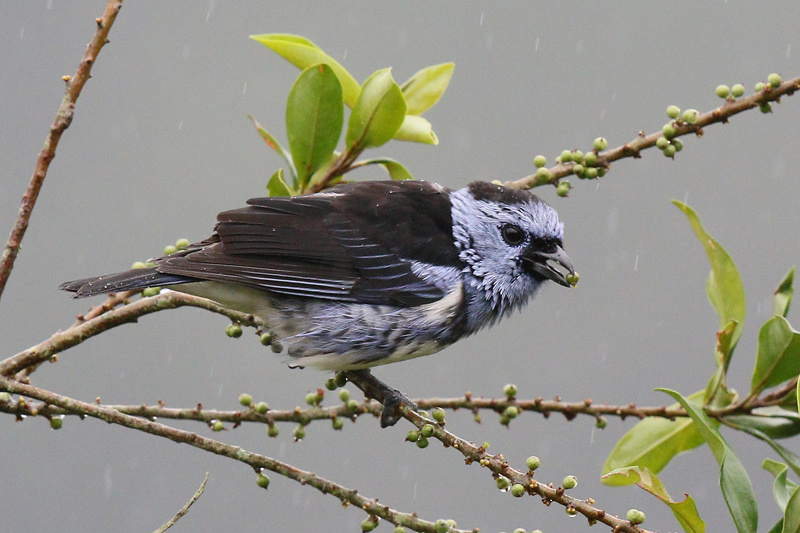 It is an uncommon tanager and habitat loss has not improved things for it, Serra dos Órgãos National Park, just two hours drive from REGUA, is one of several protected areas where this species has been found, but the risk of deforestation outside of the safety of Reserves such as REGUA and the National Park mean the species is becoming more isolated. 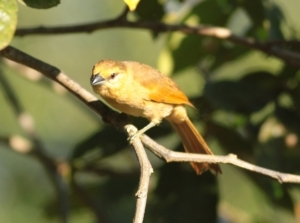 The Brown Tanager can be confused with the Buff-fronted Foliage-gleaner, the same rufous supercilliary line, but the typically “tanageresque” thick bill is the giveaway. These birds like insects but will eat small fruit. So why is it around? Another of Natures mysteries, but it certainly was thrilling to view from the tower offering great sightings and photographic opportunities to those with cameras and binoculars. 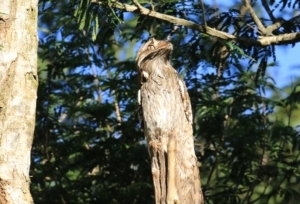 Though Birdlife and IUCN state the Long tailed Potoo (Nyctibius aethereus) occurs across all South America, it also warns the population is declining. The species refined distribution map suggests that in some time the Atlantic Rainforest and the Amazonian species might well be split. This magical bird is rarely seen and highly desired by most bird observers around the globe. With its nocturnal habits, its call is a long loud “Raaauuulll…” and the local population is scared by its unexpected call. It is usually found perched on snags and high stumps and although it’s a large bird, it is well camouflaged and slow to move that often one just misses it. 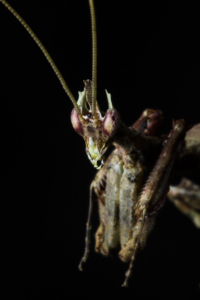 This species requires good habitat and we are lucky to have one that doesn’t mind being photographed. 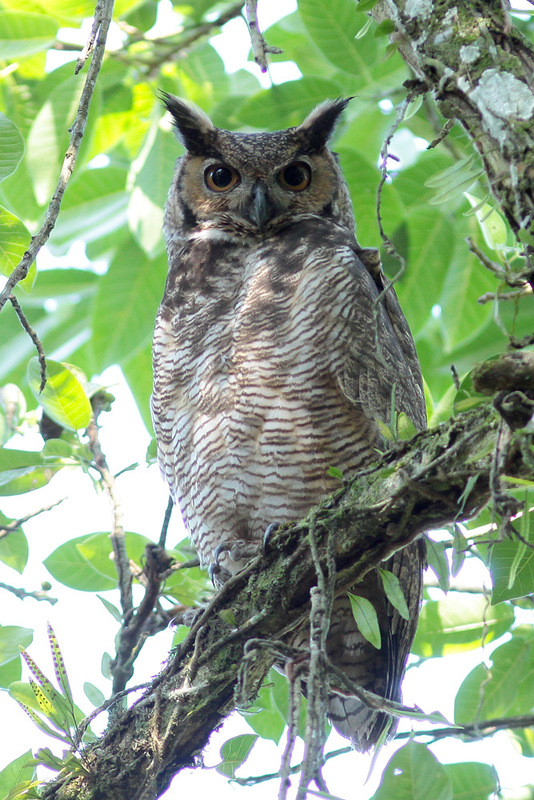 Lee Dingain spent lot of time observing this species and wrote an excellent paper that was published in Neotropical Birding. The Blue-winged Macaw (Primolius maracana) is one of those very special Psittacidae that occur between coastal Brazil spanning west to Bolivia and Argentina. 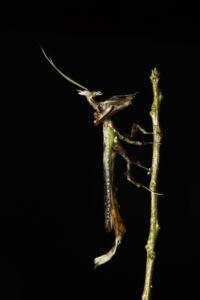 They are found in an area in the North East of Brazil, but they generally seem to occupy the extent of the Atlantic Rainforest. No longer so common, we remember seeing them nesting in thick bamboo clumps but that was a while ago and before our wetlands were developed. Perhaps they are not fond of water bodies as they are now observed only on the rain shadow side of the Serra do Mar mountain range. 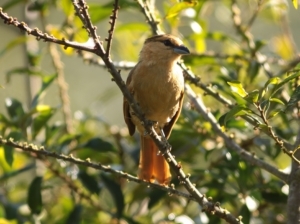 We like to show these friendly yet shy birds to visitors on the Sumidouro trail in search of other endemics such as the Three-toed Jacamar and Serra Antwren. These are all drier region species and one can see these wonderful Macaws on tall Imperial Palms typically chatting together in what appears profound chitchat! The Atlantic Forest snake species, Bothrops jararaca, a type of pit viper, is one that locals hold in the highest regard and with good reason. It is dangerous only if one steps on one and accidentally gets bitten. 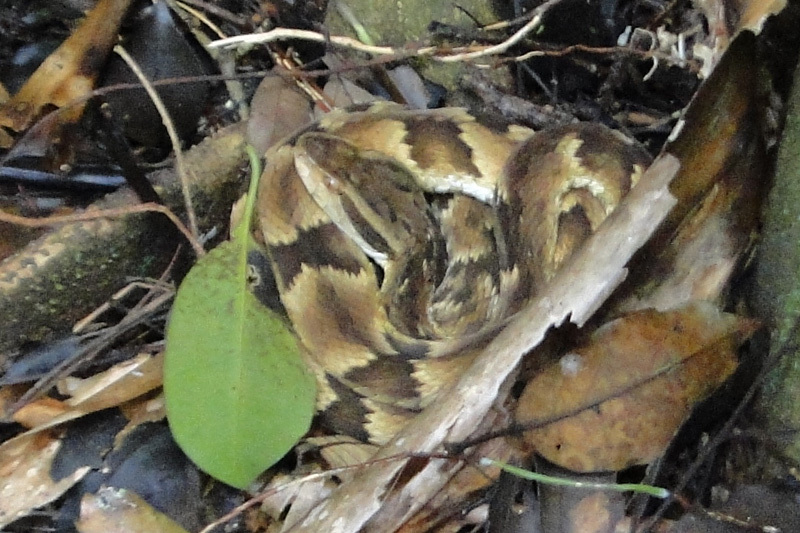 According to serpent specialists, snakes are not uncommon in REGUA’s forests. I have to admit that although I have walked many times in the forest I have failed to find one. However, I am sure that finding one coiled on the path can be a harrowing experience. In the distant past most local people would kill every snake irrespective of colour, thickness and length. 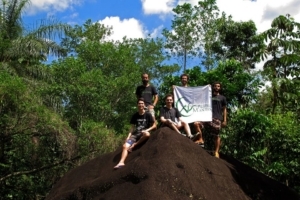 Today the REGUA rangers know that reptiles form an important part of our biodiverse forests and are not aggressive. They now leave them to their own business, and are helping to spread the word that unless they are inadvertently disturbed, most snakes would slither off into the forest before we are even aware of their presence. REGUA’s World Land Trust “Keepers of the Wild” project sponsored ranger Rildo da Rosa Oliveira found this one by a rock and left it apparently dozing. He didn’t want to look closer! The Atlantic Rainforest endemic Solitary Tinamou (Tinamus solitaries) has to be one of the hardest birds to see at REGUA. I have only once seen one walking a distant trail some years ago. The bird leapt onto the path in front of me and we walked serenely in single file for what seemed like an eternity but perhaps it was only a few seconds before it left. I rejoined the bird group I was with half an hour later and told them excitedly what I had seen. All I could see on their faces were torturous expressions of sadness. Never again! The Solitary Tinamou occurs throughout the Atlantic Rainforest and suffers from the loss of habitat. Hunters’ reputation depended on bagging these birds, but with the conservation efforts and reduced hunting the populations are rising and the birds can be heard throughout the reserve. 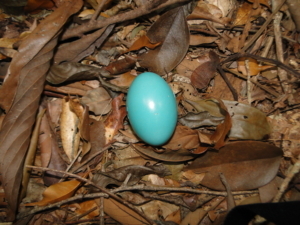 Ranger Rildo da Rosa Oliveira found this single egg. He wasn’t able to go back to make sure it hatched, but we do hope all is well for the chick and its parents. 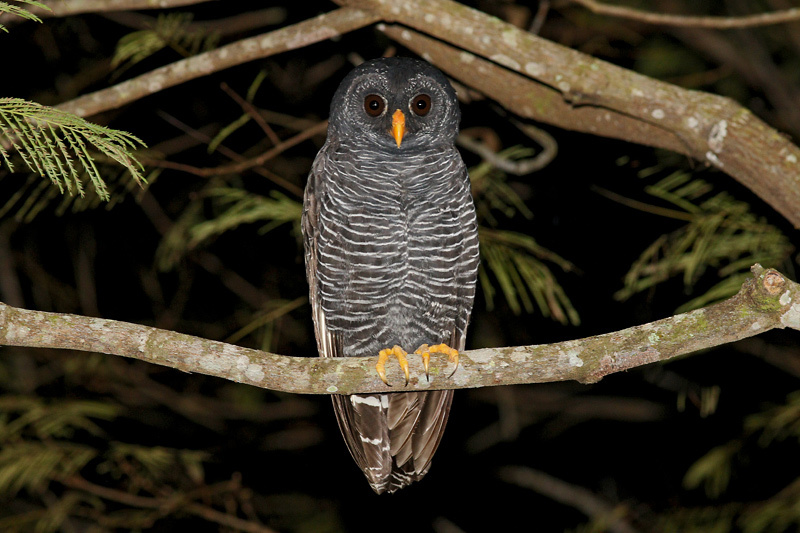 The austral winter months see fewer visiting birders than the spring, when birds are more vocal and on territory, but winter birding in the Atlantic Forest brings its own rewards and is equally exciting. Some species are actually much easier to find at this time of year, including the rare Black-legged Dacnis and large mixed-species flocks in the forest make for exciting experiences. Also, the lodge garden feeders are much busier, with many species that breed at higher elevations moving lower where temperatures are higher. 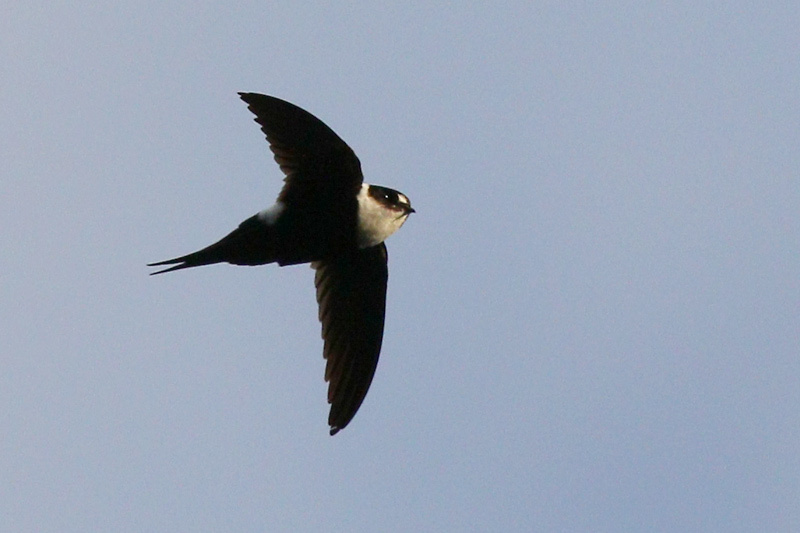 Here are the avian highlights on the reserve for June and July. Casa Anibal/4×4: Black Hawk-Eagle, Spot-billed Toucanet, Saw-billed Hermit, Spot-breasted Antvireo, White-eyed Foliage-gleaner, Black-capped Foliage-gleaner, Buff-fronted Foliage-gleaner, Green-headed Tanager and Red-necked Tanager. 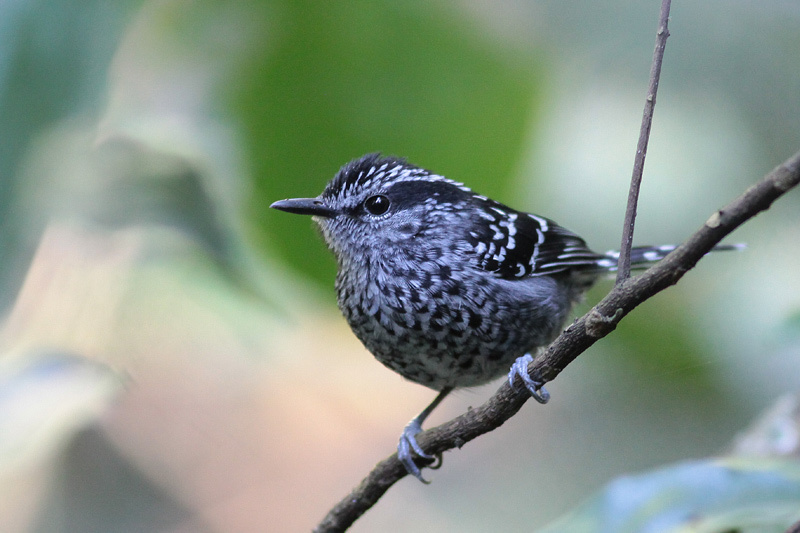 Forest Trail: White-bibbed Antbird (an excellent record for this trail), Surucua Trogon, Rufous-capped Motmot, Blond-crested Woodpecker, Yellow-throated Woodpecker, Reddish Hermit, Lesser Woodcreeper, Olivaceous Woodcreeper, Unicoloured Antwren, Scaled Antbird, Eye-ringed Tody-Tyrant, White-throated Spadebill, Southern Antpipit, Long-billed Wren, Moustached Wren, Hooded Tanager, White-bellied Tanager, Rufous-headed Tanager, Red-crowned Ant-Tanager and Swallow Tanager. 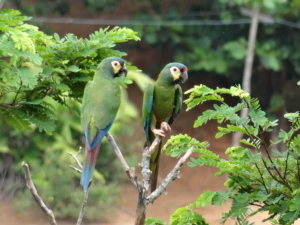 Lodge garden: Red-ruffed Fruitcrow (the first record for the garden on 2 July), Black-banded Owl (5-6 July), up to 5 Black-legged Dacnis, Common Potoo, 1 White-eyed Parakeet (6 July), Maroon-bellied Parakeet, Blue-winged Parrotlet, Toco Toucan, lots of Channel-billed Toucan, Tropical Parula, White-bellied Tanager, Azure-shoulder Tanager, Yellow-backed Tanager, Orange-bellied Euphonia, Purple-throated Euphonia and Buff-throated Saltator. Waldenoor Trail: Mantled Hawk (very reliable here), Frilled Coquette, Toco Toucan, Plain Parakeet, Yellow-fronted Woodpecker, Rufous-capped Motmot, Crescent-chested Puffbird, Blue Manakin and Black-throated Grosbeak. Waterfall Trail: Solitary Tinamou, Brown Tinamou, White-necked Hawk, Saw-billed Hermit, Surucua Trogon, Black-throated Trogon, Blond-crested Woodpecker, Yellow-throated Woodpecker, Scaly-headed Parrot, Planalto Woodcreeper, Rufous-breasted Leaftosser, Spot-backed Antshrike, Scaled Antbird, Star-throated Antwren, Black-cheeked Gnateater, Rufous-capped Antthursh, Slaty Bristlefront, Pin-tailed Manakin, Blue Manakin, Southern Antpipit, Grey-hooded Attila, White-bellied Tanager, Rufous-headed Tanager, Red-crowned Ant-Tanager and Yellow-green Grosbeak. Wetland Trail: Grey-bellied Spinetail, female Masked Duck, Yellow-billed Cuckoo, Tataupa Tinamou, Boat-billed Heron, up to 12 Capped Heron (an excellent number), lots of Snowy Egret (they seem to be increasing at REGUA), Black-and-White Hawk-Eagle, Laughing Falcon, Lesser Swallow-tailed Swift (small numbers over the wetland in the evenings), Rufous-sided Crake, Blackish Rail, Limpkin, Amazon Kingfisher, Ringed Kingfisher, Green Kingfisher, Sooretama Slaty-Antshrike, Grey-capped Tyrannulet, Hangnest Tody-Tyrant (both very unusual here), Rusty-margined Flycatcher, Hooded Tanager and Black-capped Donacobius. 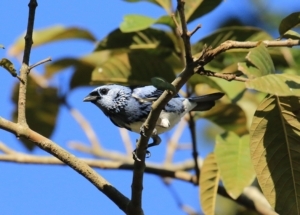 Elsewhere at REGUA, Shrike-like Cotinga, a male Tufted Antshrike and White-bibbed Antbird were all seen along the trail to the São José Tower, a Harris’s Hawk, Black-and-white Hawk-Eagle and Rufous-fronted Thornbird (the later now much scarcer at REGUA now that the reforestation is becoming more established) were seen along the dirt road to Casa Pesquisa, and the 2 Tropical Screech-Owls were still roosting by the conservation centre. On our night-birding excursion Giant Snipe, Mottled Owl, Scissor-tailed Nightjar and Collared Forest-Falcon were among the birds seen.